I ordered this book and I love it. It includes the Withey Mausoleum at Oakhill Cemetery. William S. Conant was a Cellist- Princeton Class of 1890 Bachelor of Arts and 1892 Electrical Engineering. “Cellist William Shubael Conant eventually pursued a successful career as a consulting engineer, and on his death in 1951 left the University with 250,000.00 to endow the music professorship that bears his name. The William Shubael Conant Professor of Music chair at Princeton University” From Alexander Leitch, A Princeton Companion, copyright Princeton University Press (1978). His Burial Memorial states 750,000.00, Lee M Withey. He worked 3 years for Westinghouse in Pittsburgh including the Long Distance Power Transmission Exhibit at the Chicago World’s Fair. 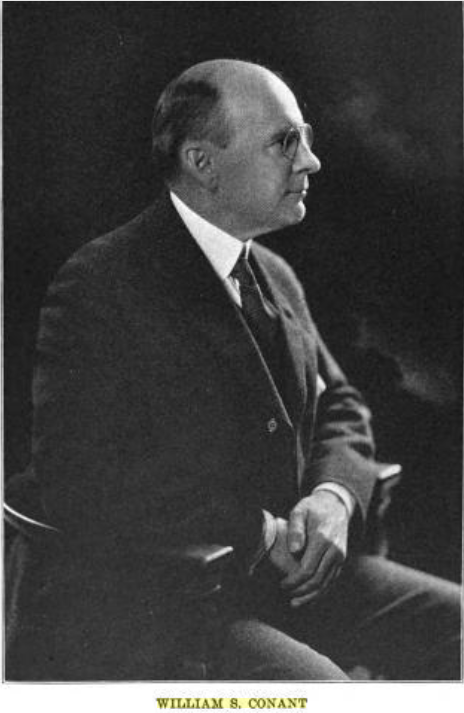 Later, in Detroit, he formed partnership Jesse Merrick Smith, later President of American Society of Mechanical Engineers. They designed and supervised the construction of electric light and power units, steam plants, interurban railways, factory, hotel and office building installations. After Jesse M. Smith moved to New York William continued and later became connected in a technical and managerial capacity with a number of manufacturing enterprises in the expanding city of Detroit. He served as Major of Ordnance during World War 1 at Springfield Armory in Massachusetts, where he was made officer in charge of construction. His wife, Frances Elizabeth was the daughter of Lecturer and Writer, George R. Wendling. After retirement in 1923 they sold their house in Detroit, traveled in Europe and later purchased another home in Washington D.C. and a summer cottage in Bay Head New Jersey. His father, John Shubael was Captain in first Brigade 23rd Army Corps and engaged in the battle Tibbs Bend under General Moore and the battle of Franklin and Nashville under General Shofield. He was later in command of the Military Prison at Louisville. This was actually a short military enlistment. He was a successful in business and also did extensive traveling in Europe with his wife. Later in life he was elected Commander of the Michigan Commandery of the Loyal Legion. William S. Conant was my First cousin 3 times removed.